Dr. Monica cleaned the wound carefully and applied a temporary splint on the bear’s broken leg to keep it stabilized for a few days. Fortunately, the fractures are fairly well-aligned, so the Wildlife Center veterinary team will opt for conservative management rather than surgery. During the next two days, the team will carefully craft a custom-made splint for the bear’s leg that can be left on as the fractured bones heal. The bear received pain medications, antibiotics, and anti-inflammatories. The cub was placed in an oxygen cage for respiratory support. Your donation will help care for this critically injured bear -- and all the patients the Wildlife Center will receive this year. Thank you! 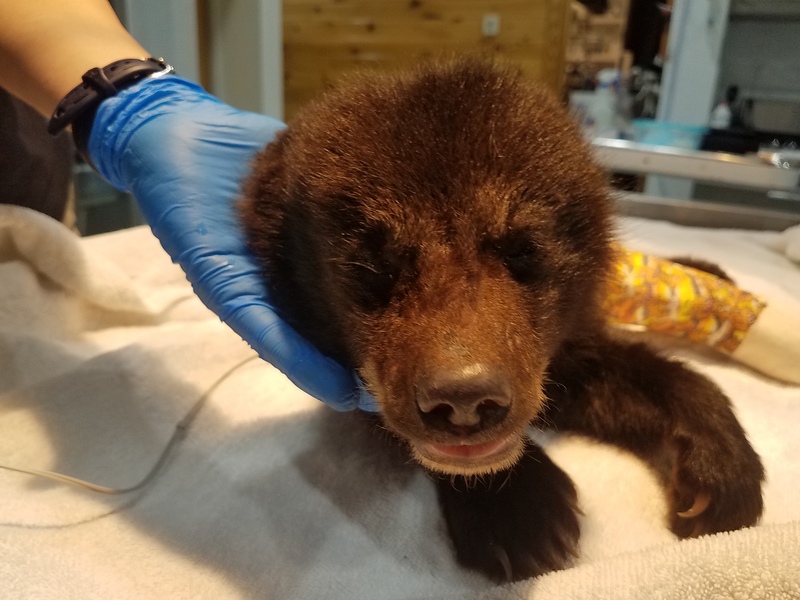 On July 2, the veterinary team brought Black Bear cub #18-1089 into the hospital for an examination of the injured hind limb and bandage removal. The bear was sedated for the exam; Dr. Ingrid and veterinary technician intern Jenna found that the bear’s toe amputation site was clean and healing well. They decided to leave the bandage off and applied a protective silver spray to the small wound. The bear’s formerly fractured leg feels healed and stable, and the bear was cleared to be in the entire Large Mammal Isolation enclosure with the other 10 cubs. On Friday, June 22, the veterinary team anesthetized Black Bear cub #18-1089 for follow-up radiographs and a bandage change. The team was pleased to find that the bear’s fractured leg is healing well; the femur has healed well and is very stable, and there is a solid callus formed on the tibia. The veterinarians decided to leave the splint off and re-bandaged the cub’s healing foot. The cub will be moved to the connecting chute of the Large Mammal Isolation enclosure; as the leg continues to heal, Dr. Ernesto wants the cub to move around more, but still wants the cub’s movement restricted. The cub will be able to walk short distances, which should help re-build atrophied muscles. This housing will mean that the 10 cubs in the Large Mammal enclosure can’t have the full run of both sides of the enclosure, so rehabilitators Kelsey and Shannon divided the cubs into two groups of five on each side until cub #18-1089 can have access to a larger space in about 10 days. On June 17, the veterinary team anesthetized Black Bear cub #18-1089 for radiographs and a bandage change. The cub has been contained in a Zinger crate to limit her movement during the healing period, though the rehabilitation staff have reported that the cub has been a difficult patient, since she likes to knock over her water, which gets her bandage wet. Dr. Monica carefully removed the bandage on Sunday and noted that the bear had a new wound on the first digit of her injured leg; the joint of the toe was also dislocated. Radiographs revealed that the fractured bones were healing appropriately, though the bear’s toe injury would require amputation, which shouldn’t prevent release. Dr. Monica was able to successfully remove the tip of the bear’s toe, though there was not enough skin to close around the wound. She carefully bandaged the wound and re-applied a hard cast splint on the bear’s healing leg. The next bandage change and check is scheduled for Friday, June 22. On June 6, Black Bear cub #18-1089 was moved to the vestibule of the Large Mammal Isolation enclosure. Due to the cub’s injuries and bandage, the young bear needs to remain in a Zinger crate until her leg is fully healed, but at least she is able to hear, see, and smell the other 10 cubs at the Center. Each day, the rehabilitation staff checks the bear’s bandage as they clean her crate and offer her a mush bowl twice a day. The bear is eating well and has gained weight. On June 10, additional radiographs were taken to check on the bear’s leg; everything was within normal limits. The next set of radiographs will be on June 17. On June 12, Wildlife rehabilitator Brie noted that the bear’s bandage was a little damp and was beginning to unravel; the vet staff will check the bandage on June 13 and may re-wrap the outer layer of the bandage if needed. The staff reports that the bear cub #18-1089 is feisty and eating well. On June 3, Dr. Monica was able to apply a hard cast to the cub’s fractured leg. To keep the hard cast clean, it’s covered with removable vet wrap that will likely need to be changed daily as it becomes dirty. The cast will remain on for three weeks, but the staff will take radiographs every week to check on the healing progress; radiographs can be taken through the cast. The veterinary team has been closely monitoring Black Bear cub #18-1089’s bandage in the days since her admission. On Sunday, Dr. Monica anesthetized the cub so that she could check and clean the bear’s healing leg laceration; she also attempted fitting the cub with a custom cast. Unfortunately, the casting material didn’t set properly, so Dr. Monica replaced the bandage with a splint again, and another attempt will be made this week when new casting material comes in. The cub is eating well and is transitioning to bowl-feeding; the rehab staff feed her three times a day. She continues to receive pain medication, antibiotics, and anti-inflammatories.